You may want to secure your Droid X for a number of reasons. If you’re just worried about securing the Droid from accidental dialing while it’s in your pocket, simply use the sliding lock on the touchscreen. You can also add two additional types of security locks to your phone: A pattern lock and a passcode lock. The Screen Lock is the most basic security option. It won’t keep other people from being able to use your phone, but it might prevent your pets, your young children, and the change in your pocket from accidentally dialing a number. From the Home screen, press the Menu soft button. Place a green check mark by the Security Lock item. If the green check mark is there already, you’re set to go. Otherwise, touch the gray box to place a check mark there. When the Screen Lock item is unchecked, you no longer see the main unlocking screen for the Droid X; pressing the Power button summons the Home screen, not the unlocking screen. One of the best ways to secure your phone and its information is to create an unlock pattern. This pattern must be duplicated (or followed) to unlock the phone and make calls, though unlocking isn’t required for answering the phone. Choose Settings→Location & Security→Security Lock. The Security Lock item is unavailable when the Screen Lock item hasn’t been selected. If you haven’t yet set a pattern, you see some directions and the Next button. Repeatedly touch the Next button, or let yourself be amused by the animation. Eventually, you see the screen where you set the unlock pattern. 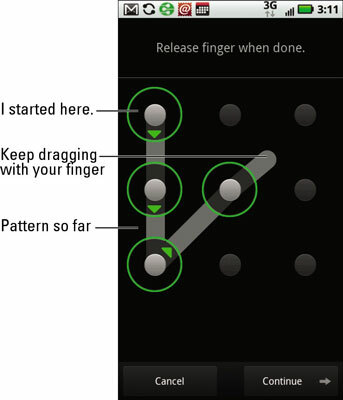 Draw the unlock pattern with one of your stubby fingers. You can hit each dot only once in the pattern. Draw the pattern again to confirm that you remember the pattern. If you can’t remember your pattern, touch the Cancel button and start over again at Step 3. Also consider adding gingko biloba to your diet; it’s supposed to be good for your memory. The pattern lock is required whenever you turn on the phone or awaken it from Snooze mode. To remove the pattern, follow Steps 1 through 3 in the preceding list and choose None from the Security Lock Type menu. Confirm the unlock pattern, and it’s disabled. Choose Settings→Location & Security→Passcode Lock. The Passcode Lock item is unavailable if the Screen Lock item hasn’t been selected. An input screen appears. 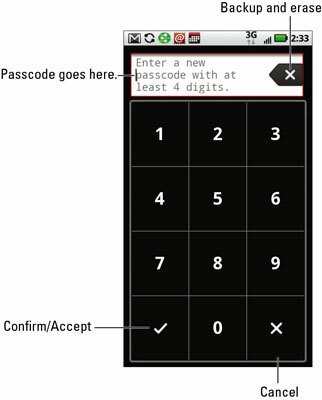 Enter at least four numbers for the passcode; then touch the check mark button to confirm the passcode or the X button to cancel. After entering the passcode the first time, you’re asked to repeat yourself. You need to assure the Droid X that you haven’t just forgotten the number you input. The passcode is required when you turn on or wake up the Droid X. To disable the passcode, follow Steps 1 and 2 in the preceding list. Choose the item None from the Security Lock Type menu. You need to punch in the passcode one more time to confirm.